Welcome to Namibia. Our representative meets you on arrival at the Windhoek International Airport, and transfers you to Windhoek, which is in the center of the country and is the starting point for most Namibian adventures. Enjoy a short tour of Namibia’s capital city, nestled among rolling hills, bounded by three mountain ranges – the Eros in the east, the Auas to the south and the Khomas Hochland in the west. Due to its colonial heritage, it is a blend of new and old, Africa and Europe. Along the capital’s main street you’ll discover well-preserved German colonial buildings that contrast markedly with today’s modern architectural styles. You may spot Herero women in their traditional Victorian dresses mingling with executives attired in the latest fashions. After breakfast, you fly via scheduled light aircraft to the Sossusvlei, landing at Sossusvlei Desert Lodge’s airstrip. You are welcomed by your local lodge guide and transferred to your lodge. This afternoon you can begin exploring with a sundowner drive, a guided walk, or quad-biking in the dunes. 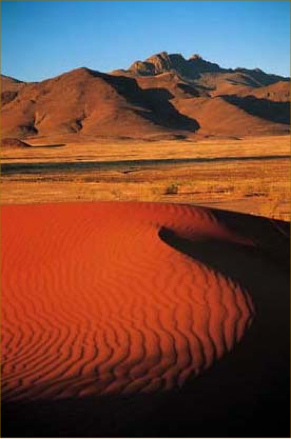 NamibRand Nature Reserve began as a conservation initiative in 1984. It now extends over 180,000 hectares/444,790 acres of pristine Namib Desert. Before becoming a private nature reserve, the land had been used primarily for sheep farms. Today, you can admire nature in its original state, as indigenous animals and plants are flourishing once again. The reserve shares a common border of nearly 100 km/62 mi with the Namib-Naukluft National Park to the west, and the natural boarder of the imposing Nubib Mountain Range to the east. The particular attraction of NamibRand is its diversity of desert landscapes, representing virtually all facets of the Namib Desert. Expansive sand and gravel plains and endless stretches of grass savannah alternate with majestic mountain ranges and vegetated dune belts of deep red sand. The variety of flora and fauna is as fascinating as the color nuances of the landscape, which change continuously as the day progresses. Sossusvlei Desert Lodge in the northern foothills of the reserve is designed to make the most of its breathtaking surroundings while providing a sophisticated and luxurious stay. The lodge consists of glass and stone curves, where walls and windows fold away completely to open onto the grassy plains, distant dunes, and mountain ranges. Each spacious, air-conditioned suite features a shaded deck, split-level bedroom and living room with fireplace for cool evenings, en suite glass encased bathroom and outdoor shower. to experience the dunes while the light is soft and shadows accentuate their towering shapes and curves. Your guide offers insights on the formation of the Namib Desert and its myriad of fascinating creatures and plants that have adapted to survive these harsh environs. The most frequently visited section of the massive Namib Naukluft National Park is Sosssusvlei, famous for its towering apricot-colored sand dunes which can be reached by following the Tsauchab River Valley. Sossusvlei itself is actually a clay pan set amid the star-shaped dunes which stand up to 300m/984ft above the surrounding plains, ranking them among the tallest dunes on earth. The deathly white clay pan contrasts against the orange sands and forms the endpoint of the ephemeral Tsauchab River, within the interior of the Great Sand Sea. The river course rises south of the Naukluft Mountains in the Great Escarpment. It penetrates the sand sea for some 55km/31mi before it finally peters out at Sossusvlei, about the same distance from the Atlantic Ocean. Until the encroaching dunes blocked its course around 60,000 years ago, the Tsauchab River once reached the sea. Sand-locked pans to the west show where the river flowed before dunes shifted. About once a decade rainfall over the catchment area is sufficient to bring the river down in flood and fill the pan. On such occasions, images of dunes and camel thorn trees around the pan are mirrored in the water. 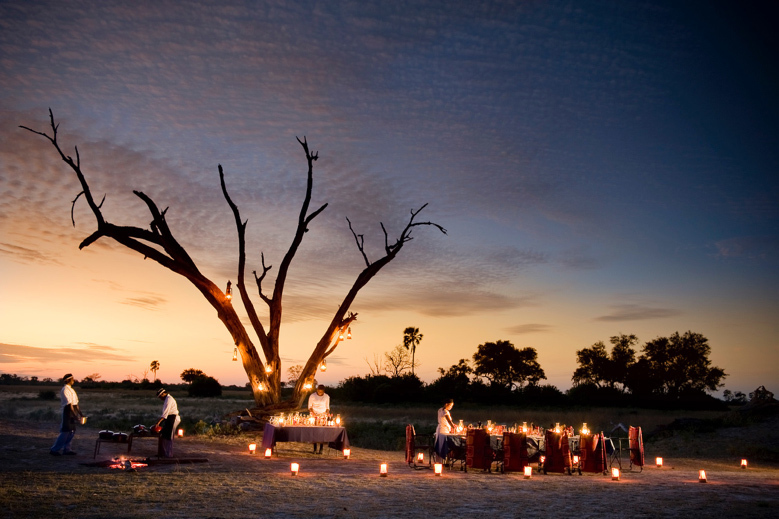 Once you have explored the dune fields, enjoy a relaxing picnic breakfast in the shade of a camel thorn tree. Return to Sossusvlei Desert Lodge in the early afternoon for a late lunch, stopping off to view Sesriem Canyon along the way. After a leisurely breakfast, return to the airstrip for your scheduled light aircraft flight to Damaraland. The flight route begins with an amazing bird’s eye view of Sossusvlei and the great dune sea that stretches to the coast. You then fly north along the coastline (fog permitting) over abandoned mining camps, shipwrecks, Sandwich Harbour, salt pans and Walvis Bay Lagoon before landing at Swakopmund Airport to refuel. Then continue north and inland into the heart of Damaraland, where you will spend two nights at Damaraland Camp. On arrival, you are welcomed by your private naturalist guide, who will accompany you for the remainder of your journey. This afternoon, you can choose to enjoy a guided walk in the local area or simply relax at camp and soak in the beauty of your surroundings. The area offers displays of color, magnificent flat-topped mountains, interesting rock formations and bizarre-looking vegetation. The present day landscape has been formed over millennia by erosion caused by wind, water and geological forces. The result is rolling hills, sand dunes, gravel plains and ancient river terraces. Your camp is situated in this rugged beauty on the northern banks of the Huab River. This private paradise is wrapped in stunning silence, beauty and tranquility. There are just nine large canvas tents, each with en suite bathroom. The dining room, bar and curio shop are under canvas while an open fire is found nearby. After an early breakfast, you will be treated to an exciting 4x4 excursion along the ephemeral Huab and Aba Huab River valleys to explore this remarkable region and to search for game, including the elusive desert-adapted elephants if they are in the area. In habitats with sufficient vegetation and water an adult elephant consumes as much as 300kg/661lbs of roughage and 230 liters/61 gallons of water daily. Their ranges extend from river catchments in northern Kaokoveld as far south as the northern Namib. Apart from the Kunene River, seven river courses northwards from the Ugab provide them with possible routes across the desert, right to the Skeleton Coast. The biggest rivers are the Hoarusib, the Hoanib, the Huab and the Ugab. 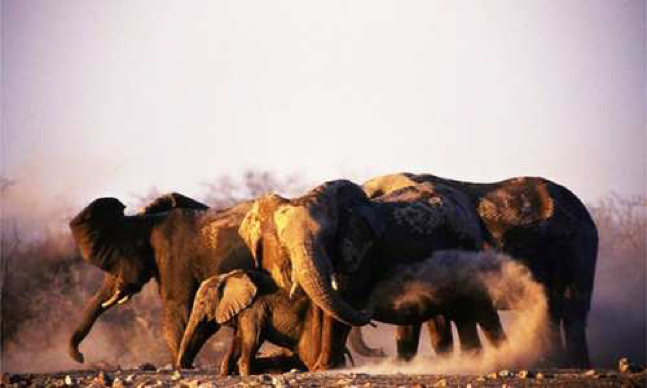 The elephants in Kaokoland and the Namib walk further for water and food than any other elephant in the world, with the typical home range of a family herd greater than 2,000km²/770²mi, or eight times as big as ranges in central Africa where rainfall is much higher. They walk and feed at night and rest during the day. To meet their nutritional and bulk requirements they browse on no fewer than 74 of the 103 plant species that grow in their range. Not a separate species or subspecies, they are an ecotype unique to Namibia, and behaviorally adapted to hyper-arid conditions. Elephant in Mali on the southwestern fringe of the Sahara Desert are the only others known to survive in similar conditions. Damaraland is home to a variety of other specially adapted wildlife, including black rhinos and giraffe. Enjoy a picnic lunch in the shade of a large Ana tree, or you also can return to camp for lunch, if you prefer. This afternoon, you can choose to see the ancient Twyfelfontein rock engravings (note that this will make for a very long day). Alternatively, can take a walk in the area with your guide, or simply relax and enjoy some well-deserved leisure time. Twyfelfontein, ‘doubtful spring,’ was named by the first European farmer in the area. Strewn over a hillside amongst the flat-topped mountains of red sandstone, Twyfelfontein’s boulders and slabs of red sandstone hold some 2,500 prehistoric engravings that depict wildlife, animal spoor and abstract motifs. 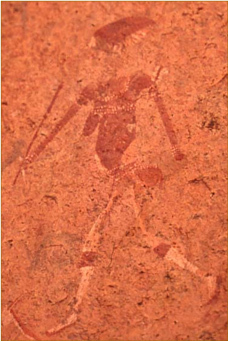 It is perhaps the largest and finest collection of petroglyphs in Africa. The engravings show animals such as elephant, giraffe, kudu, lion, rhinoceros, springbok, zebra and ostrich that once used to drink from a fountain at the bottom of the hill. In some cases, footprints were engraved instead of hooves or paws. The abstract motifs feature mainly circles. Stone tools and other artifacts found here suggest that hunter-gatherers occupied the site over a period of perhaps 7,000 years. The engravings lie along two circular routes, one of which is an hour’s climb and the other is approximately 40 minutes longer. It’s one of Namibia’s key national monuments as well as a UNESCO World Heritage Site. The Organ Pipes are another geological curiosity in the area consisting of a mass of perpendicular dolerite columns that intruded the surrounding rocks about 125 million years ago, and have since been exposed in a ravine due to river erosion. After breakfast, you and your guide visit a local Himba settlement. The semi-nomadic Himba people can change locations without notice. They are among the last of the traditional peoples of Namibia, and have little time for or interest in conventional practices. You will learn about the customs and traditions of this very proud nation, and gain insight into their beliefs, way of life and everyday routine. The Himba, Tjimba and other Herero people, who inhabit Namibia’s remote northwestern Kunene Region, are loosely referred to as the Kaokovelders. 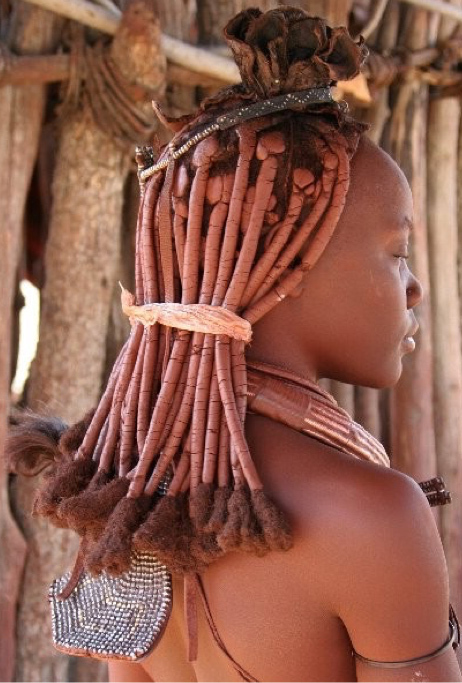 The largest group are the Himba, who live in scattered settlements throughout the Kunene Region. The Herero are semi-nomadic pastoralists who tend wander from one watering place to the next. For many centuries, they have lived a relatively isolated existence and were not involved to any noteworthy extent in the long struggle for pasturelands between the Nama and the Herero. They are a tall, slender and statuesque people, characterized especially by their proud yet friendly bearing. The women especially are noted for their unusual sculptural beauty, enhanced by intricate hairstyles and traditional adornments. They rub their bodies with red ochre and fat, a treatment that protects their skins against the harsh desert climate. captured leopard and cheetah. 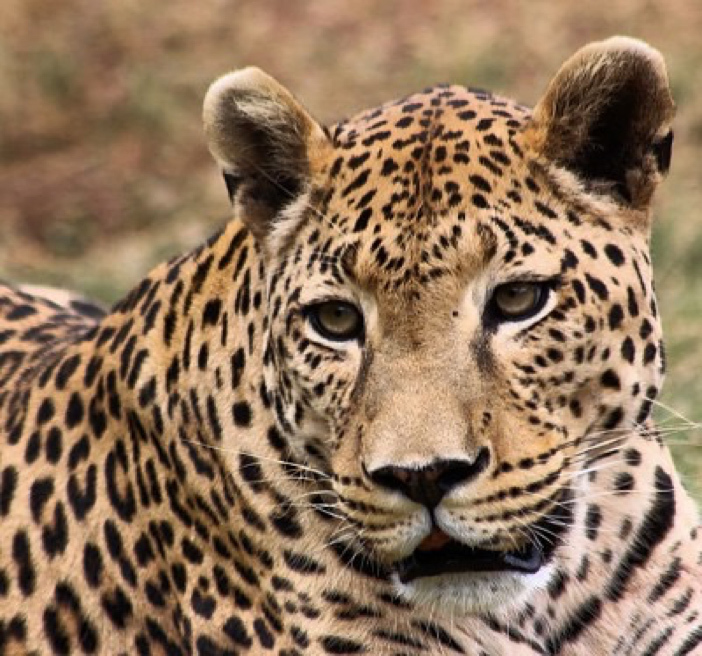 Close encounters with leopard and cheetah are an unforgettable highlight. You will discuss with your guide your particular interests for your stay here. 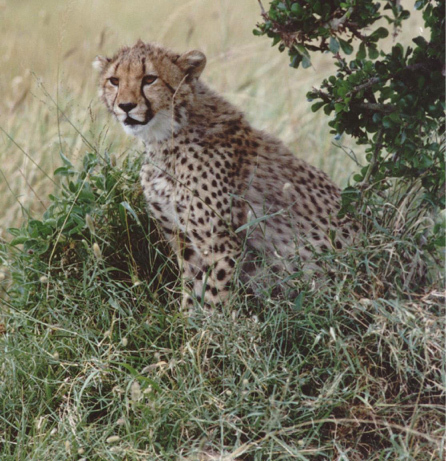 Activities include leopard tracking by vehicle; a visit to the cheetah welfare project; radio-tracking of the rehabilitated cheetahs, wild dogs and spotted hyenas on foot; sharing a day in the life of a Bushman during a guided walk; and spending time in the night hide where nocturnal animals such as porcupine, caracal, honey badger and leopard may be seen. You have an easy morning to sleep in or take time to explore the city before transferring to the Windhoek International Airport for your international flight to Maun (flight cost additional). Upon arrival in Botswana and after clearing customs, you will meet your representative, who will assist you with the arrangements for your scheduled light aircraft transfer to Selinda Camp in northern Botswana. After one last activity and brunch, your local guide will transfer you to the airstrip for your flight over the Okavango Delta to Little Vumbura. Upon landing at the airstrip, you are met by a local guide and transferred to the camp in time for a light lunch. After settling in and a siesta, you will depart on a game-viewing activity of your choice. 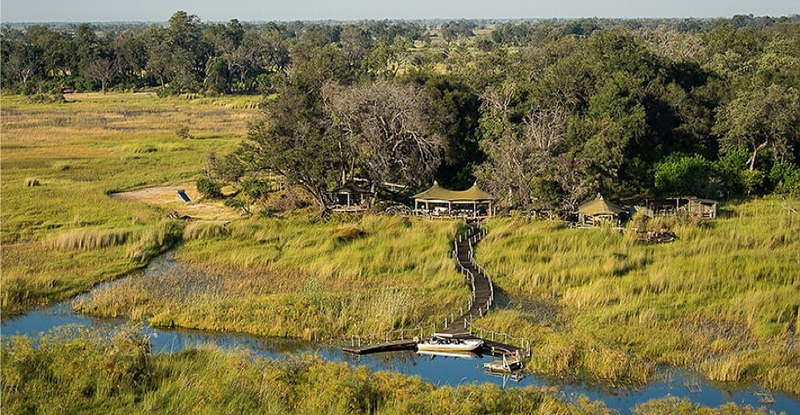 Little Vumbura is situated in a private concession in the northern part of the Okavango Delta. Here you have the option for varied activities on both land and water. You have the option to spend the rest of the day game viewing, on nature walks, or boating. Surrounded as it is by water and lying close to large rivers, the camp’s focus is on water-based activities with mokoros traversing floodplains under the guidance of experienced polers, and motor boats travel up and down the permanent channels. Game drives in open Land Rovers allow guests to get close to animals in the savannah areas. If you like, you can request a walking safari around the islands to enjoy Africa from a different perspective. Game viewing is consistently good year round here with lion, leopard, elephant, sable and buffalo along with extensive plains game. Today you continue to explore this amazing environment. 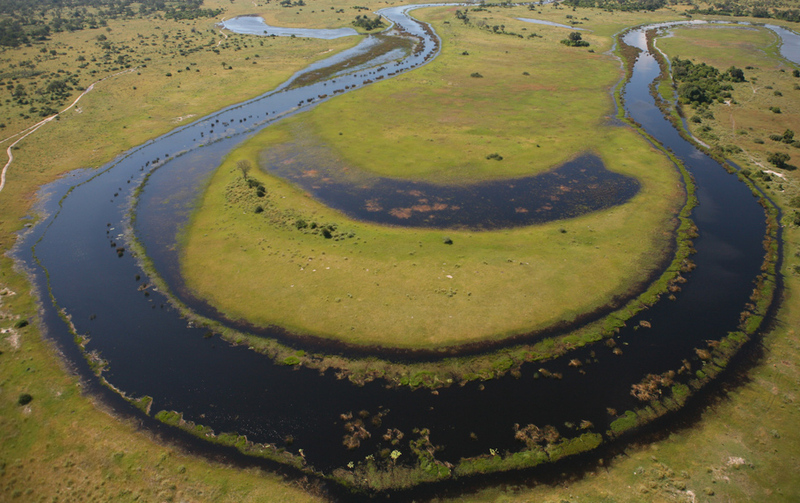 The Okavango River flows inland into the Kalahari Desert, creating a labyrinth of lagoons, lakes and hidden channels covering an area of roughly 15,000 km²/5,792 mi². It is the largest inland delta in the world. Delta is a magnet for the wildlife that depend on its permanent waters. The delta is continuously moving, mysterious, placid, gentle and beautiful, from a wide and winding river channel, it spreads through tiny, almost unnoticeable channels that creep away behind a wall of papyrus and phragmites reeds, into an ever-expanding network of increasingly smaller passages. These link a succession of lagoons, islands and islets of various sizes, open grasslands and flooded plains in a mosaic of land and water. Palms and towering trees abound, throwing their shade over crystal pools, forest glades and grassy knolls. The Okavango's water is remarkably clean and pure. Prices are for land only, double occupancy. Our Destination Specialists combine creativity with their impressive knowledge to customize clients’ journeys to meet each guest’s interests, whether that is honeymoon couples, families or special interest groups.